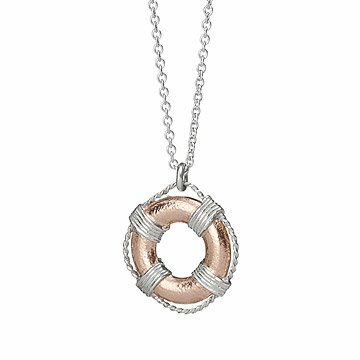 This nautical necklace is sure to float the boat of the naval enthusiast or your own personal life saver. This nautical necklace is sure to float the boat of the naval enthusiast or your own personal life saver. British jewellery designer Alex Monroe handcrafts each piece in his London studio out of Sterling Silver, and then plates the buoy in rose gold. British jewelry designer Alex Monroe grew up in the Suffolk countryside, which has forever shaped the influence and inspiration for his work. Alex's aim has always been to make great quality, originally designed jewelry, which is desirable yet well priced. His pieces are instantly wearable, and always much loved. We visited Alex's London studio, took lots of pictures, and asked him questions. Read about it on our blog. Jewelry should always be taken off before the pool, shower, or sea. We would suggest storing your jewelry in acid free tissue in a jewelry box when you are not wearing it. Very pretty piece, with a very special meaning for me. The life buoy is part of the AFSP's design. When I look at this necklace, I find peace in the AFSP family. It is well constructed, lightweight and durable enough to wear as an everyday necklace.